Seafile is a private cloud software to that provides similar features like Dropbox, mega.co.nz, and others, just hosted on your own server. Seafile is based on the python programming language and it is released under an open source license so that you can create your own private cloud and it will be much more secure. Seafile supports encryption to store your data securely. To encrypt files in a storage library, you need to set a password when you create the library. The password won't be stored in the Seafile cloud. So even the administrator of the servers cannot view your encrypted data without the password. In this tutorial, I will install Seafile on CentOS 7 with Nginx web server and MariaDB as the database server. Login to the centOS server with your ssh root password. Edit the SELinux configuration file with vim. Replace value 'enforcing' with 'disabled'. Reboot the server to apply the change of the SELinux policy. Wait for server rebooting, then login to your server again as root user. You should see 'Disabled' as the result. Seafile is based on python, so we need to install python for the installation first. Seafile has support for SQLite and MySQL/MariaDB databases, I will use MariaDB as the database for seafile here as it provides a better performance than SQLite. 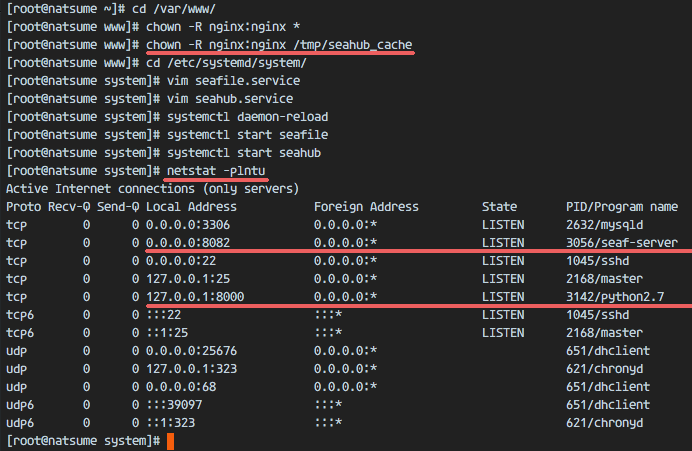 Nginx is used as the reverse proxy for Seafile and Seahub. In this step, we will install several python packages, MariaDB and Nginx. We begin with the installation of the EPEL repository on our CentOS server. Next, install python the packages, MariaDB and Nginx. Wait until all packages are installed. In step 2, we've already installed the MariaDB server, we just need to start the service and configure the root password now. Type in your root password. The MariaDB root password is configured and we can login to the mysql shell now. 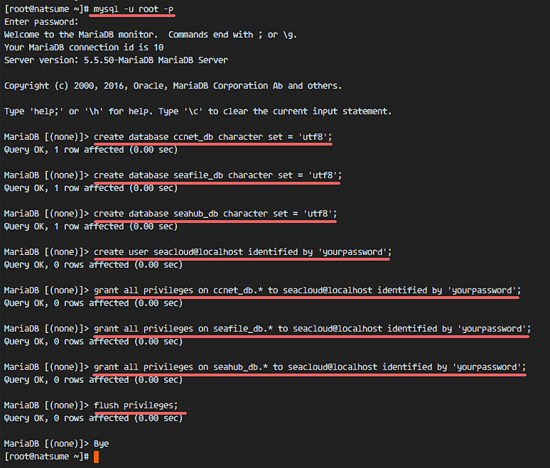 Notice: The MariaDB commandline shell is named mysql. And we will create a new user 'seacloud' with the password 'yourpassword'. Replace yourpassword with a secure password! Login to the mysql shell with the mysql client. Run the mysql queries below to create the databases and the user for the seafile installation. Replace yourpassword in the above commands with your own password. In this step, we will install Seafile. Seafile will be executed under the nginx user so we can use nginx as the reverse proxy for the seafile and seahub services. We will install seafile under the nginx user in the directory '/var/www/seafile', create that dirctory and enter it with cd. Download Seafile with the wget command, and extract the downloaded archive. Rename the directory to 'seafile-server' and switch to that directory. 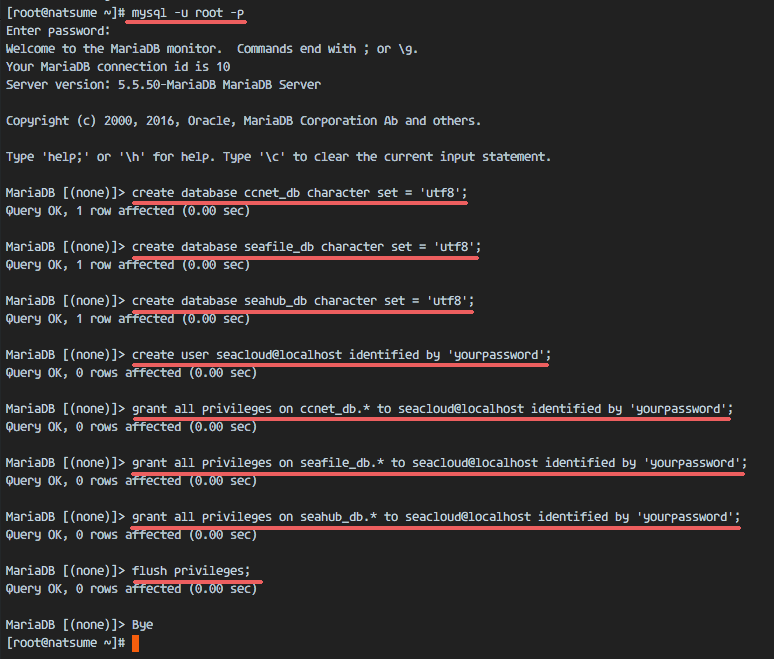 Execute the 'setup-seafile-mysql.sh' file to configure the database. Press enter and the script will create the database tables for the seafile. Now we can start the seafile and seahub services. 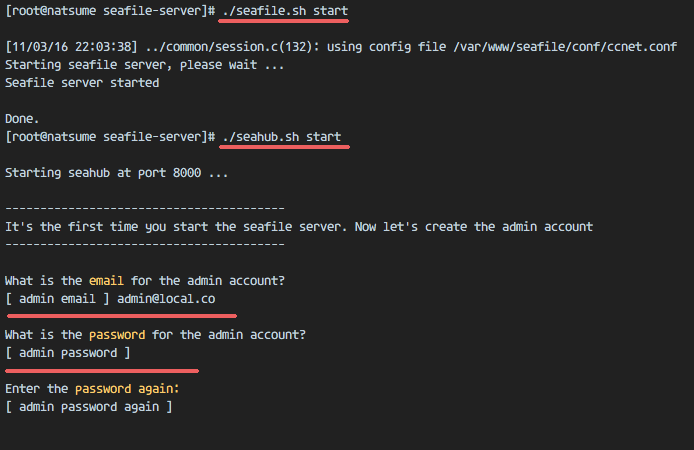 When the seahub.sh file is executed, we will be asked for the admin configuration. 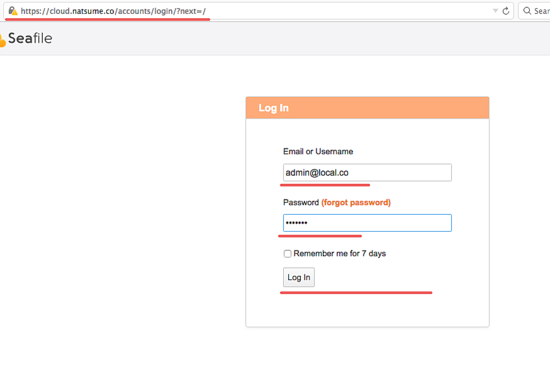 Type in your admin email and password, then the seahub service will runing. Seafile is installed and running now, we can access Seafile from a web browser with the server IP on port 8000 (in my case - 192.168.1.115:8000), but we will not do it now because we will use a reverse proxy for the seafile server and we will run seafile with a systemd service file. So we need to stop seafile and seahub service for now. Now create new seahub.service file. Reload the systemd service and start seafile and seahub with systemctl. Make sure there is no error and check that the seafile and seahub service is running on port 8082 and 8000. 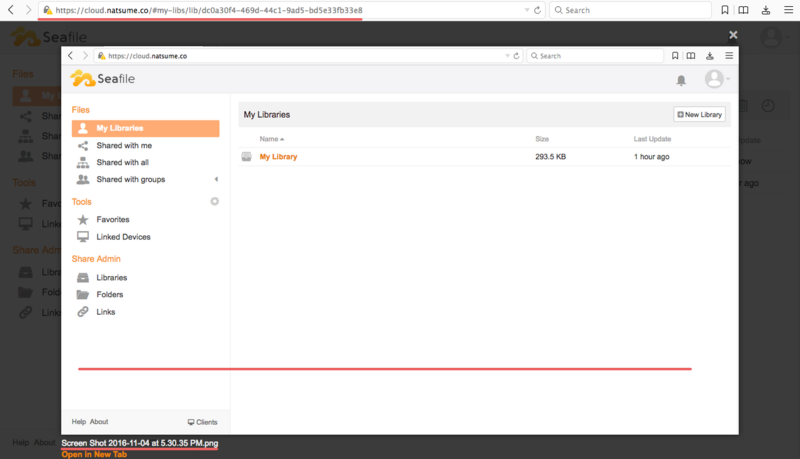 For this tutorial, we will run seafile over a Nginx proxy, and Nginx will provide secure (HTTPS) connections for data security. We can use a free SSL certificate file or the paid SSL certificate, this does not matter for the configuration. In this step, I will generate a self-signed SSL certificate file with the OpenSSL in the '/etc/nginx/ssl' directory. Answer the certificate details as requested by OpenSSL like your name, state, email, domain name etc. Then change the permissions of the directory and certificate files. The SSL certificate files have been generated. In this step, we will configure Nginx as a reverse proxy for the seafile-server on port 8000 and 8002. 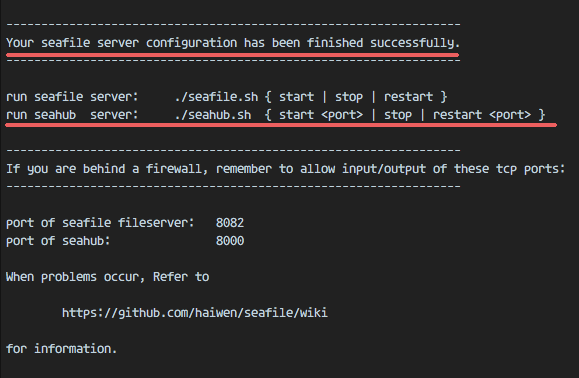 Go to the nginx configuration directory and create a new virtual host file for seafile. I will use use 'cloud.natsume.co' as the domain name. Please replace that with your own domain name in the config above. 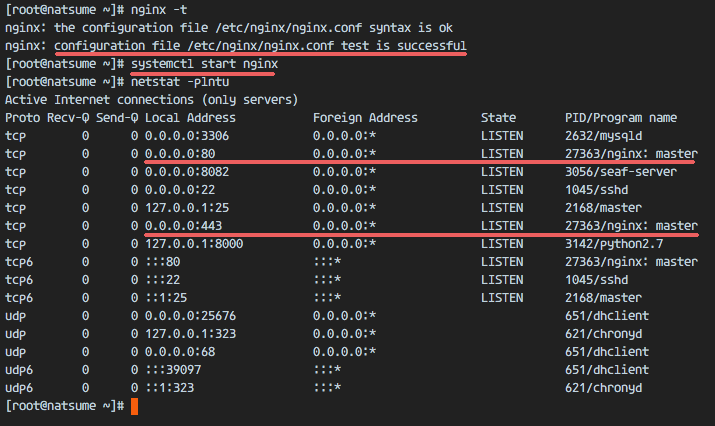 Now test the Nginx configuration and make sure that there are no errors. Next, we have to add the domain name to the seafile configuration. Go to the seafile directory and edit the configuration file. Change the service URL to your domain name. Edit the seahub configuration file. Replace the domain name with your domain here again. Save and exit. In step 7, we've configured Nginx to use the HTTP and HTTPS port. 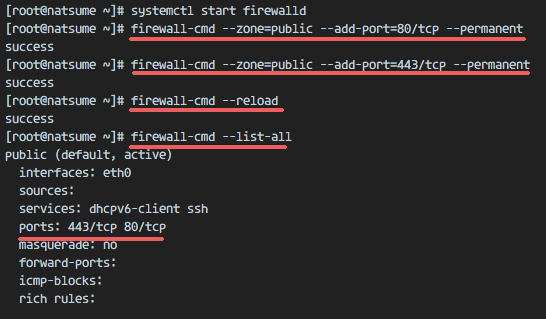 Now we have to open that ports in the Firewall by adding them to firewalld. Reload the firewall configuration and check the port list. Open your browser, type the seafile domain name, in my case cloud.natsume.co and you will be redirected to the https connection. 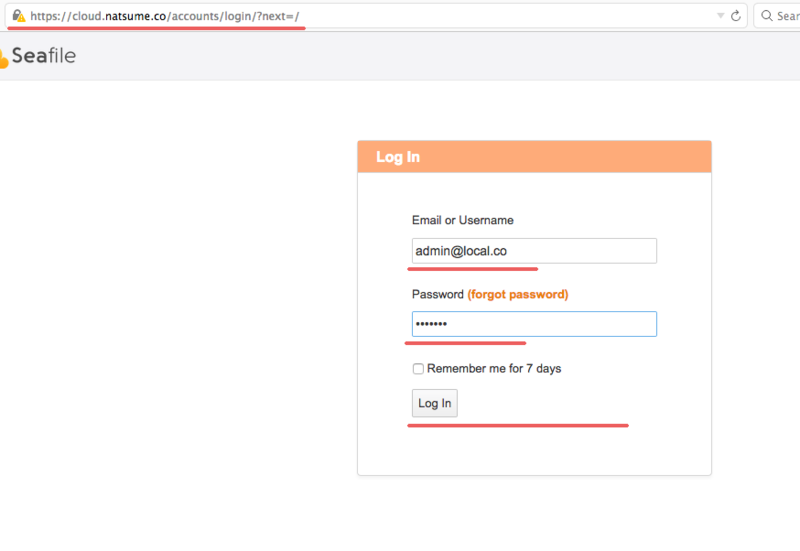 Type your admin email and password and click 'Log in'. 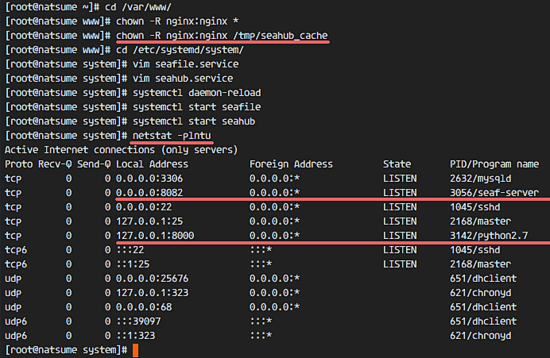 Seafile with Nginx as Reverse Proxy and SSL has been successfully installed on CentOS 7 server. With the wide variety of cloud applications today, Seafile is a private cloud solution that is good for use on this day. 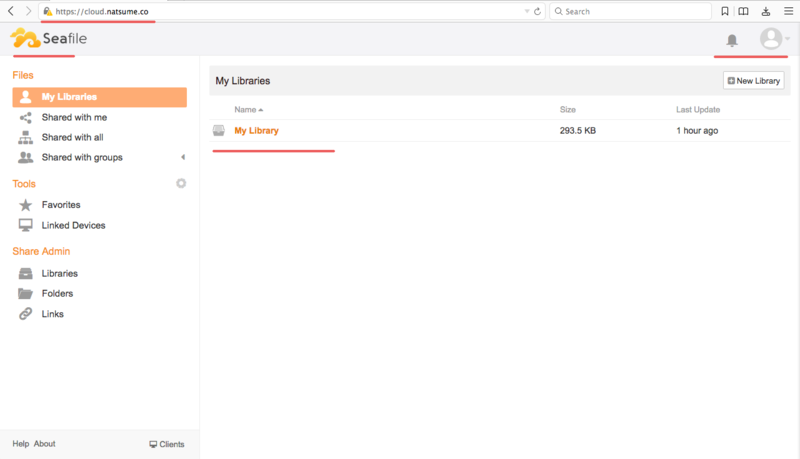 With the encryption feature at the library/folder level, you can store your data securely on a Seacloud server. 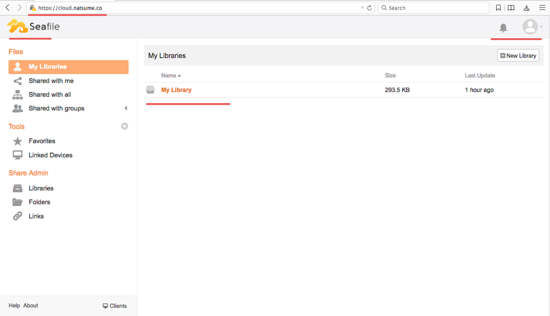 Beside that, Seafile is easy to configure and implement on your own server. When i was setting it up on my own server(home), i went a slightly more automated way but ill have to re-do this using your way as it look more secure. to point to my seafle server that actually has /var/www/seafile/seafile-server/seahub? Sorry, i am a total dummy. My requirement is, I want to create the server which should backed by S3. so, what extra thing I will have to do in your tutorial steps? Thank you! I installed Seafile. I faced 2 problem. Although I was able to solve one and still stuck in 2nd problem. 1st problem was, nginx missing sites-available , I was able to solve this issue. 2nd problem is server is only accessible via IP-Address. Just FYI, I am using a cloud server with a Public-IP. Very accurate information. I installed in digital ocean droplet, without any issues. Thanks so much. Everything went smoothly with this installation of the pro version on a Digital Ocean droplet. I have to few steps in the middle to install missing programs. I am completely new to Linux and working at this level. However, my SSL certificate show invalid. How do I fix this? Great tutorial but unfortunately it needs to be updated. Seafiles no longer uses fastcgi and the reverse proxy is not working correctly.